Motion pictures as a commercial business made their debut on 14 April 1894 at 1155 Broadway, New York , at the Holland brothers' Kinetoscope parlour. Ten machines were set up, with customers paying 25c to see a row of five machines, which offered such sights as Eugen Sandow, the two Ena Bertoldi films, Blacksmith Scene and Highland Dance. Shortly afterwards, on 17 May, a second parlour was opened by the Holland brothers in a Masonic Temple in Chicago, with a further ten machines. The men to whom Thomas Edison had entrusted the first commercial exploitation of his invention were Andrew and George Holland, businessmen from a prominent Ottawa land development and newspaper publishing family (there is a Holland Avenue in Ottawa named after the family). Andrew had been a parliamentary and law reporter; both brothers had variously dealt before in publishing, bookselling, typewriters, steamship lines and, crucially, Edison Phonographs. With the formation by Norman Raff and Frank Gammon of the Kinetoscope Company to exploit the new machine, Andrew Holland (the prominent figure of the two and a founder member of the Kinetoscope Company) was well placed and eager to take up the opportunity. Following the successful debut of the Kinetoscope, the Holland brothers further exploited the machine, including selling six to George Georgiades, who had taken the Kinetoscope to Paris by July 1894. Then in 1896 came the launch of the Vitascope and projected Edison film, and the Hollands were granted exclusive rights to its exploitation in Canada. The Vitascope made its debut on 21 July 1896 in West End Park, Ottawa, a joint venture betwen the Hollands and the Ottawa Electric Railway Company, with magician John C. Green ('Belsaz') hosting. The Vitascope moved on to Toronto in September (where it was joined by the newly-arrived Lumière Cinématographe). 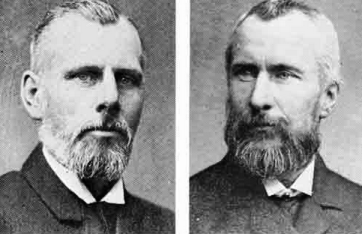 Having sold the various territorial rights to Canada, and having made what money they could from the seemingly passing phenomenon, the Holland brothers were finished with cinema history.